The top seed heading into the post-season was locked up, there was a three way tie for the Big Ten regular season title and two teams got in their final tune ups before USAG nationals in the penultimate regular season weekend of men’s gymnastics. The superb form on his Yurchenko two and a half looks even better with a stick at the end. The Hawkeye senior notched a career high on his standout event to help Iowa upset Penn State and earn a share of the first-ever Big Ten regular season title. The Big Storyline: Oklahoma swept all six events and event titles as the Sooners posted their top road score of the season while beating California and UIC. As usual, senior Yul Moldauer paced Oklahoma, winning three of the four events he competed and posting the nation’s top score this season on parallel bars. 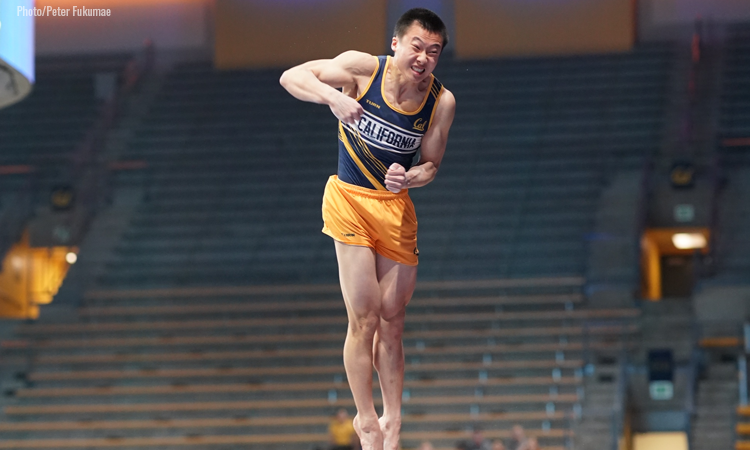 Darren Wong led the way for California, taking the all around title and posting the Golden Bears’ top score on four events. UIC placed third in the tri-meet but posted its top score of the year and was paced by freshman Kaleb Booth, who notched a sixth-place finish on floor and placed eighth on vault. Implications: All three teams will remain ranked the same next week, and Oklahoma has locked-up the No. 1 ranking heading into the postseason. Records: With this win, Oklahoma is now in sole possession of the third-longest win streak in NCAA history, breaking the tie with the UConn women’s basketball teams 111-consecutive wins. The Big Storyline: Anton Stephenson put on a show on his senior night, winning three event titles and the all around to lead his Huskers to an upset of third-ranked Michigan. The Wolverines began their meet with a disastrous pommel horse rotation and were never able to overcome the deficit. Cameron Bock, Ryan Dunning and Justin Hopgood all picked up event titles for Michigan who won a share of the Big Ten regular season title, but would’ve won it outright with a win. Stephenson’s all around total is a new season high while Nebraska also benefited from runner-up finishes from Joshua Everitt on rings and Griffin Kehler on high bar. Implications: Next week, Michigan will remain ranked third while Nebraska will slide to eighth. Records: Nebraska set new season high scores on rings (68.000), vault (72.600), and parallel bars (69.700) en route to a new season high team score. The Big Storyline: Illinois won five event titles and the all around but couldn’t overcome bad pommel horse and parallel bars rotations, falling to Ohio State on the Buckeyes’ senior night. Johnny Jacobson paced the Illini with his all around and floor wins while senior Alec Yoder grabbed the parallel bars crown for Ohio State’s only event title. Yoder, however, fell on his best event, pommel horse, and lost this time in the battle of top three-ranked gymnasts on the event to Illinois’ Michael Paradise. Implications: Both teams will stay ranked the same next week. Records: The Buckeyes earned their second highest score of the year while setting a new season high on pommel horse (68.550). The Big Storyline: Minnesota took care of business at home, defeating both Iowa and Penn State to earn two wins and a share of the inaugural Big Ten regular season title. Shane Wiskus won floor and the all around while three other Gophers picked up event titles to propel Minnesota to a new season high and first score above 410 this season. With Iowa’s upset of Penn State, the Hawkeyes also earn a share of the Big Ten title thanks to their consistency across all six events and event wins by Jake Brodarzon and Andrew Herrador. A meltdown on pommel horse and a rough high bar rotation took Penn State out of the meet early, but the Nittany Lions still earned a win with Brennan Pantazis’ tie for first on floor. Penn State was without pommel horse star Stephen Nedoroscik, who placed sixth on the event competing for the U.S. at a World Cup event in Doha, Qatar. Implications: Penn State and Minnesota’s rankings will not change but Iowa will rise to seventh. Records: Minnesota set new season highs on both pommel horse (68.000) and vault (72.750). Brodarzon’s winning rings score is a new career high for the Iowa senior. The Big Storyline: Washington got two event titles from senior Nathan Tsuji, and the Huskies posted their top road score of the season, but it wasn’t enough to overcome host Air Force and Frankie Valentin’s double-event title performance. This was the final regular season meet for both teams as they will compete at USAG nationals next weekend. Falcons standout Lukas Texeira won his fourth high bar title of the year while Washington’s Connor Pattison collected a top-three finish on parallel bars and Connor Petellin did the same on pommel horse. Implications: Both teams will be ranked the same heading into next week’s championships. Records: Collin Hickey’s 14.050 on floor ranks as the ninth-highest score in Air Force history on the event.